I have a confession to make. I have never liked the color yellow. I wouldn't be caught dead in a yellow frock, refused to paint anything yellow, wouldn't even add so much as a yellow ornament on my Christmas tree. But guess what? Yellow is growing on me. I'm still not in love with it but its definitely creeping into my psyche. This all started when I agreed to help a friend plan a bridal shower. She had picked a restaurant that happened to have bright yellow tablecloths. 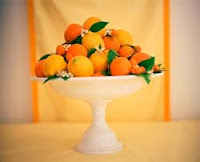 So using lemons and lemony colors in the decor made sense and every other element of the party used that as the starting point. 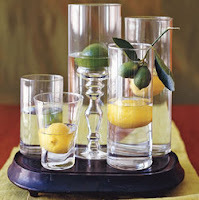 In my searching, I found tons of great yellow ideas that can be applied to home entertaining but none as simple as a lemon centerpiece! Its not a new idea of course but its one of those things that never occured to me thanks to my dislike of the color yellow. Makes me want to run out and buy a barrel! Aren't these just beautiful examples of simple but stunning ways to brigten up your table? With summer nearly over, couldn't we all use some bright centerpieces to carry us through the shorter days? 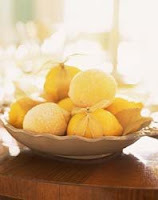 Aside from the fact a lemon centerpiece will last so much longer than flowers, they are easy to make and require no waste as you could put these yellow beauties to use in cooking or lemonade after their peak has past! I love pops of color, lemon yellow, granny smith apple green and pumpkin orange. Fresh accents in a footed bowl add a fresh zest to a room, a table and later may be used to cook with. Love yellow! Well, now you are speaking my language! I have a big huge acid lime green platter/bowl that I often fill with lemons...I stick some lemon tree branches on the bottom, and fill it with lemons. They do last for awhile, and juice best when they have been out and the skin is getting a bit hard...then you can even freeze the juice in ice cube trays(then ziplocks) Voila...2 TBSP fresh lemon juice! Helps that I have a couple of trees though. and the smell using lemons would be delicious! Me too! I just don't look good in yellow so I've never gravitated towards it. But I'm currently loving pops of lemon yellow w/ shades of gray both in clothing and decor. I'm digging yellow, too, and until lately have never been a fan! Yellow eventually pops up in my life. It was big in the 1970's then went away for a long time.  It's nice to see a return of it once again, albeit lemons. 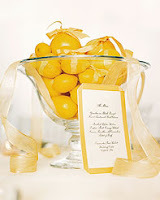 i love your idea of using lemons as a centerpiece. we've done granny smith apples before, but not lemons. i do love the color yellow. it's perfect with gray or brown. stay tuned, i'm contemplating painting our coffee table a soft mustard yellow! I'm not into yellow either, nor any primary colour (except grass green, which I like) really. Bright colours really seem to take more maintenance and things don't all go together and whatnot. I never wear these colours either. But I am acquiring a taste for yellow food and have been known to make the odd lemon tart and lemon cake, as the family likes it greatly (old folks) and I am starting to also (old me). Enjoy your new colour. I had an orange phase last year. Too funny as I just blogged about this last night! I like the color yellow when it is teamed up with blue!!! I love blue and little additions of yellow (the soft hue) just make it so soothing a combination. Interesting and timely topic. This coming week's Woman's World says that: "just looking at the color yellow can boost your mood, make you feel more optimistic and even lower stress"
I currently have a yellow kitchen and a yellow upstairs hallway and I *really* love it. Much more subdued yellows on my walls - but for the color boost you have shown - those are excellent examples! I just love the lemons! Yellow was my favorite color as a child. Now, not so much. But I like these photos you have. 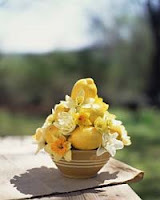 i love to decorate w/ lemons! i have a 2yr old boy...he would use them to ding me in the head!